Grouper is a type of fish that prefers to live in reefs or caves in the bottom of the sea. The price of this fish is Rp 150 thousand per kg, which is very good for suppliers. As such, grouper farming promises good returns, which usually done along the coasts with floating nets. According to Mr. Suwarman Partosuwiryo, Yogyakarta Regional Fishery director, fish consumption in the province increases steadily every year. The consumptions per capita per year were 14,54 kg, 21,71 kg, and 21,74 kg in 2012, 2013, and 2014 respectively. These numbers are still below the national average, which is 38,78 kg/capita/year. Mr. Sigit Sapto Raharjo, the Provincial Director of Marine and Fishery, adds that the demands for fish in Yogyakarta currently are 289 tons per day and 146 thousands tons per year. The current production from local fish farming is about 70 thousand tons per year, which is barely half of the market demand. The rest is filled with productions from other provinces. Pusat Penelitian Sosial Ekonomi Kelautan dan Perikanan (PPSEKP – Marine and Fishery Social Economy Research Centre) report in 2012 stated that there are nine prioritized commodities in fish farming, and grouper was on the list. The price for grouper is very high mainly because of the transport. When fish are raised in floating nets, which are usually located offshore, they travel a long distance to get to the consumers. In addition to the cost of transportation, losses also occur when fish die during transit. Being in the open sea, fish raised in floating nets are also vulnerable to diseases. To meet those challenges, PT Indmira developed Recirculating Aquaculture System (RAS) to raise grouper effectively and efficiently. The farm is located in Indmira’s headquarter complex, which on the south hillside of Mt. Merapi. The main objective of this farming is to cut the distance between the offshore floating nets and consumers. The type of grouper is called Cantan, a hybrid of kerapu macan (tiger grouper) and kerapu kertang (giant grouper). The use of RAS allows grouper farming to be operated almost anywhere, including on the mountains. RAS has mechanical and biological filters to maintain the correct salinity and get rid of wastes. There is also a UV treatment to minimize contamination from harmful microorganism. Additional of advantages of RAS over floating nets are higher density, effective disease control, and efficient feeding. Compared to offshore farming in which the recommended density is 15-20 fish per m³, RAS allows 60-75 fish per m³. Disease on the fish is minimized because the source of water is highly regulated. Feeding is also monitored and thus very efficient. Unlike open water, fish farming in ponds allows farmers to see uneaten feed, which signals overfeeding. The main challenge in fish farming is the lack of standard parameters for healthy water. While there are equipment to measure water conditions, such as temperature and salinity, farmers often do not how to interpret these data and are often left to rely on instinct with often unfortunate consequences. Failed harvest happens more frequently than desired. This problem compelled Indmira and Atnic, a subsidiary of Indmira, to develop Jala Tech, which uses internet of things (IoT) system to monitor the water quality in a fish pond. 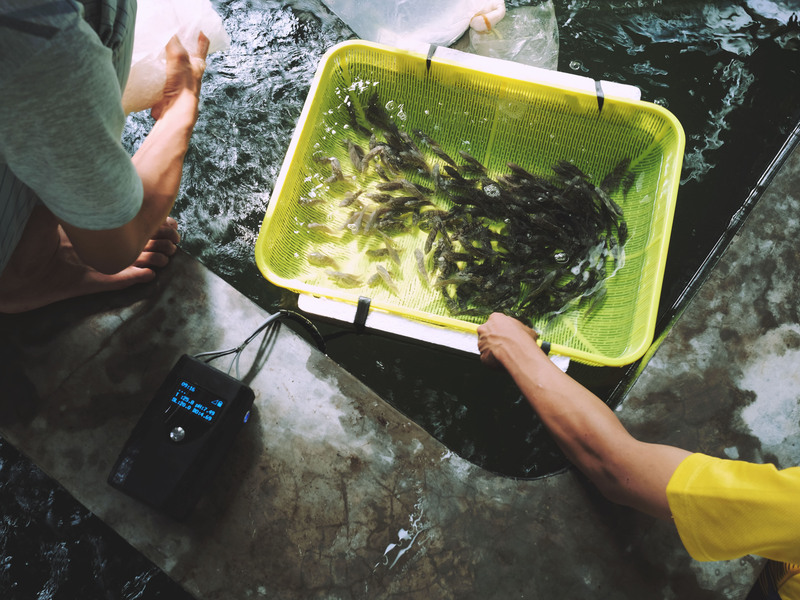 This tool can solve many problems in fish farming by monitoring water, analyzing data, and giving recommendations on steps to be taken based on the current water conditions. Jala measures dissolved oxygen, pH, salinity, and temperature at the same time. Since it is an IoT, which means it is connected to mobile devices via internet in real time, the information can be accessed anywhere at anytime. What could I buy a little seed of grouper to be tested in my area?